Welcome to the Scenic Ridge, one of the most popular Gatlinburg cabin rentals for those who love to soak up the stunning view of the Smokies. Nestled in a private area where the mountain peaks rise up all around the cabin, this is the ideal spot for a spring or summer vacation. The beautiful green foothills and peaks are a sight to behold, and that’s just the beginning of what makes this cabin in Gatlinburg so special. After you’ve had a luxurious night of sleep on the king-sized bed, step into the living room, where the huge windows will bring in the light of the sun rising over the peaks in the distance. Make yourself a cup of coffee in the fully equipped kitchen (just bring food! ), and step out onto the back deck. Settle into a rocking chair and let the pink and gold sunrise start your day off gloriously. There’s nothing like the sight of a Smoky Mountain morning, and you can feel your stress being washed away. After your leisurely morning, you can head into Gatlinburg, just 10 minutes away, for some fun entertainment, shopping, and adventure. You don’t have to leave Scenic Ridge if you don’t want to. 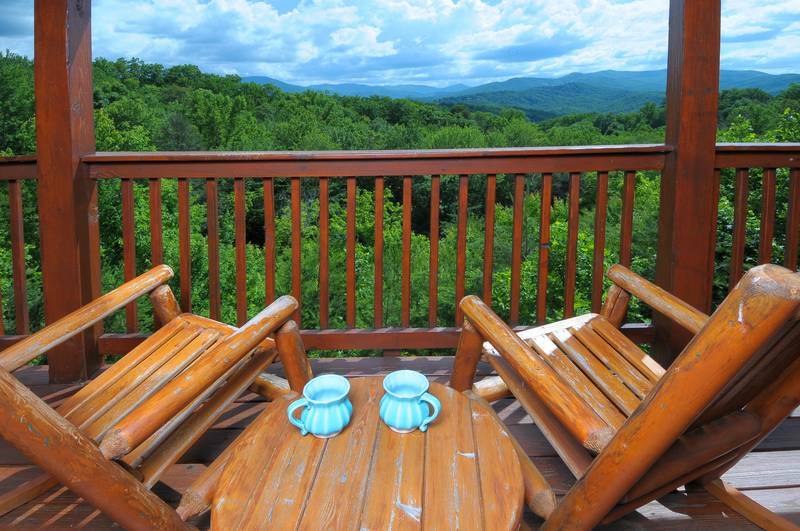 This Gatlinburg cabin includes everything you need for a day of utter relaxation away from the world. There is satellite TV, a pool table for some fun playing around, and even a private hot tub on the deck where you can watch the view while you soak away your aches and pains. The cabin includes a sleeper sofa, so it is friendly to families, and you can also bring your pet! With 1,550 square feet inside, you won’t feel cramped as you spend the day getting in some reading, or just zoning out with the view and a nap here or there. Of course, it wouldn’t be a stay in Gatlinburg if you didn’t check out just a few of the nearby attractions. At night, you can try fun things like going for a star-lit roller coaster ride on the Gatlinburg Mountain Coaster, or trying one of the many dinner theater shows in the area. This cabin in Gatlinburg is ideal for groups that have many different interests. You do what you want, your family or friends can do what they want, and you can all meet back at the cabin for a family-style dinner around the dining room table. Book your stay today in this beautiful cabin in Gatlinburg so you don’t miss out on that fantastic view.